Improvisation is more than just a useful tool for actors, it’s a different way of approaching life. Through fun games and exercises, students will gain more confidence, more creativity, and more playfulness through the basic improv skills of listening, reacting, working with others, and trusting oneself. Not only will it make you more comfortable while thinking on your feet, it’s really fun! Amanda has achieved the impossible by turning someone who'd never been on stage before, someone with severe social anxiety, into an improviser who performs in public on a weekly basis. All in less than 2 years. And it's even enjoyable (sometimes!) WHO ELSE COULD DO THAT!? I'll tell you who -- no one. I was considering taking an improv class to gain confidence in speaking and ‘get out of my head.’ I loved the class. 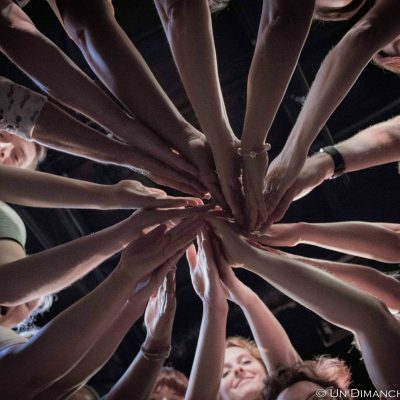 Amanda's passion came through in her teaching, and in her ability to see and draw out the potential improviser in each of us. Amanda guided us through exercises precisely and with such fun, that before we knew it - towards the end of the sessions - the skills had built upon one another and my classmates and I were creating short scenes and responding to each other in the moment. I've continued taking classes and hope to have Amanda again as a teacher! I took my first improv class with Amanda, and I’m so glad I started with her. I walked into that class terrified - I had no acting experience and was rarely funny. She created an environment where I felt encouraged and safe to be vulnerable (a rarity for me at that time)….I can also honestly say that her classes have changed my life outside of improv – I’m more open, more comfortable with failure and less stressed in social situations. I really enjoyed the safe environment that Amanda created. I am really a beginner and I never felt like an outsider during the workshop. Amanda made sure that we all walked away with a new skill and ways to think outside of the box!